In 2013 I made my first trip to Tanzania on a Fulbright-Hays Scholarship. Not only was this my first trip outside of the United States, but it was also my first experience speaking Swahili outside of the comforts of my classroom. I was terrified that I would only last one week. After traveling around to different cities and visiting with community groups, NGOs and policymakers, my nerves quickly went away and my love for East Africa and my passion for women and children’s rights began to grow. After leaving Tanzania, I could not get back fast enough. However, from the time I attended law school with my dad when I was in second grade, I always knew that law school was in my future. My dad was a non-traditional law student with two young daughters. I attended class with him everyday after he picked me up from school. I was even called on once! 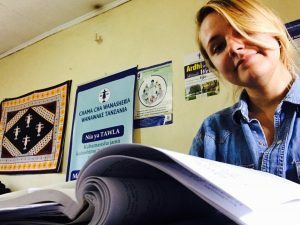 After my first semester of law school, I spent the month of December researching and applying for organizations that would hopefully bring me back to East Africa. Finally, in January I received an email from the executive director of the Tanzania Women Lawyer’s Association (TAWLA). After interviewing in both Swahili and English, she offered me an internship where I would focus on custody issues and land right issues for women. In July I finished my internship with Federal Magistrate Judge K. Gary Sebelius of the District of Kansas and hopped on a plane to Tanzania two days later. After arriving in Tanzania, with my baggage lost, I started my work. TAWLA consists of five offices in Tanzania, in the cities of Dodoma, Mwanza, Tanga, Arusha and Dar es Salaam. It is the largest legal aid organization in the country focusing on women and children’s rights. I worked in the Arusha office alongside five practicing attorneys. While the jobs at TAWLA are highly sought after, only two of the five attorneys are paid. All other members volunteer. 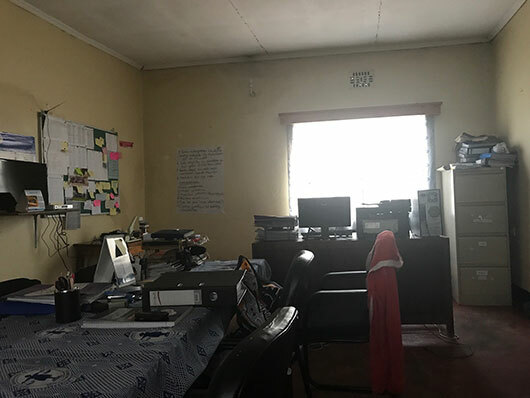 On top of regular budget restrictions that legal aid faces, TAWLA also functions with just two working computers, one testy printer and limited office supplies. Power outages or printer repairs often delayed our turnaround time for clients. My first week I was amazed by the amount of clients the attorneys would see in a day, sometimes as many as 20 for just a five-woman operation. Issues ranged from a village leader trying to take a widow’s land, to trying to remove a 15-year-old girl from her parents’ custody because they were trying to keep her from school in order to marry her off and reap the benefits of her bride price. Throughout my five weeks at TAWLA I not only noticed the lack of funding, but also the extreme poverty and barriers that our clients were facing. 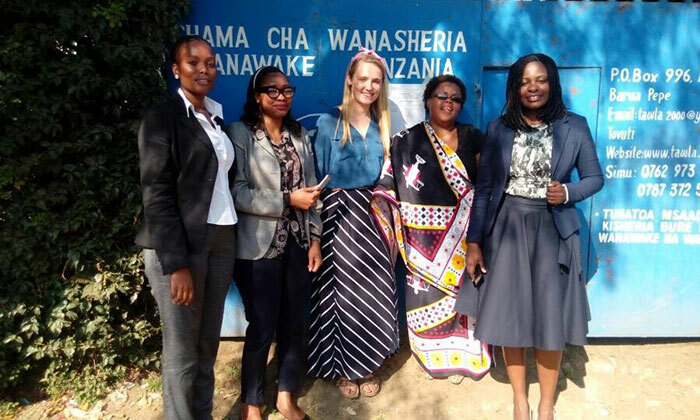 TAWLA typically charges an attorney fee of 2,500 Tanzania shillings (around one American dollar). However, most clients could not afford it or even pay for their transportation to TAWLA. Not only did the fee normally get waived, but our volunteer attorneys–who were making no salary at all–would often pay or contribute to our clients’ transportation fares. I was in awe of the attorneys’ generosity not only for their clients, but also for each other and myself. About two weeks into my trip I was rushed to a clinic on the instruction of our executive director, where I found out I had typhoid fever. When the doctors told me they wanted me to stay overnight so someone could watch me because I was living alone, one of the attorneys offered to take me in. Denning on her first day of work at TAWLA. After getting over my typhoid fever and studying the Tanzanian legal system, I began working with my own clients. I did intakes in Swahili and wrote affidavits for land issues and custody petitions. While it took awhile for clients to embrace me as their legal advocate, their confidence in me and my confidence in myself quickly began to grow. I went to Tanzania for an internship and left with not only an amazing experience, but also invaluable friends. Language is key when working with clients. Speaking clients’ native language not only helps them feel comfortable, but also helps them realize that you are passionate about your work. Talk to Career Services about funding opportunities. Have knowledge of the legal system you are working in. Make sure you do extensive medical research beforehand (I learned this one the hard way). Cast a wide net and do not give up when applying for international internships. Most important, know that you are there to learn and try to take in as much as you can. -Paeten Denning is a 2L from Overland Park, Kansas.